These chronicles are an exemple of a Content Management System created with php and MySQL. Their content is managed from a back office only accessible to the chronicler after being identified. To see every sides of a living room is getting possible thanks to our 3d showroom application that reveals all the beauty of an interior design project. Here it is a dynamic rotation of a room, not just a basic static view. 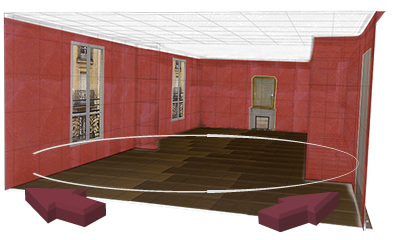 Our web application for interior designers has the great advantage to reveal every sides of a room by making it rotate on itself. To create such a 3d presentation, we need to build at least one 3d object and to localize it in a 3d space. This rotating room is made of the six sides of a cube. You can make it turn to right or left depending on the way your mousse is moving. The sides of the cube have been resized and on each ones an appropriate texture has been applied (a wooden floor, purple walls, white ceiling). A door, two windows and a chimney give a rhythm to the room. This application is very useful to reveal the beauty of a room. The light moves when the room is rotating, and therefore the light gives life to the room. Architects, building trade companies, real estate agencies should have such an application in their website to show their projects or their products.